Congratulations to Amanda Pitts whoo reeled in this 26 inch. 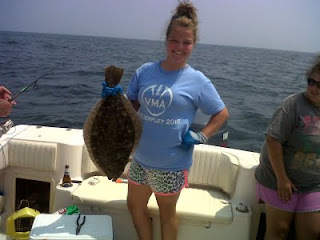 6.9 Lbs flounder at the OC Reef Friday 7-29-11! Jim Fishing on the Red Plums landed this 7Lb 8.OZ 26In Flounder at the Towsends Inlet Reef Thursday. The fish took a big minnow on a 1 ½ Oz Spro bucktail. They landed several other nice flounder with a couple of keeper sea bass mixed in. Don’t for get this is the last weekend to sign up for shimanos big give away and shopping spree to the store. 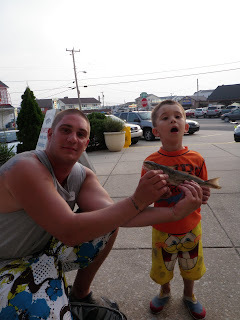 Ocean flounder fishing off Sea Isle- fish were biting large 2-3 oz Spro bucktails and large Gulp! grubs in any color. One group bounced from TI Reef to OC Reef, had several nice keepers over 3 lbs. The ocean is starting to heat up.